DHBC actively encourages women to join the club and has approximately 20% female membership and growing all the time. Women in the club participate at all levels, including racing on the road, track and in the dirt on the trails in the numerous mountain bike events around NSW. 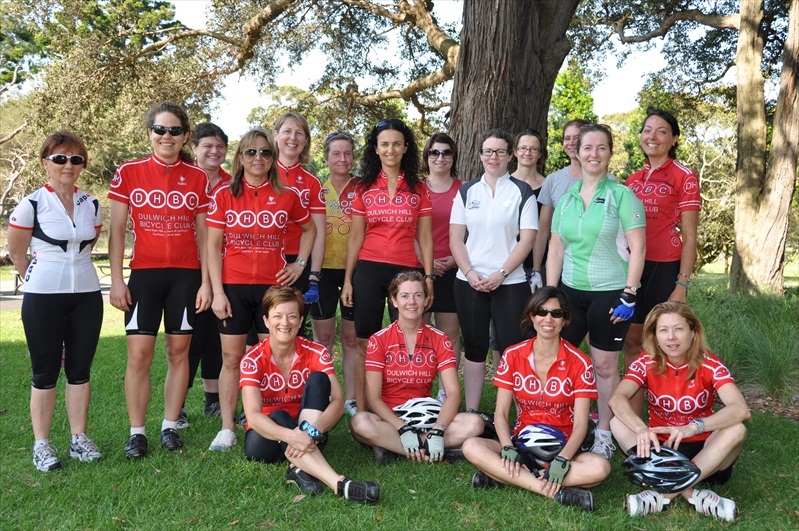 Dulwich Hill Bicycle Club is committed to getting more women into cycling and into the club and over the last year, our female membership has grown both in numbers and as a proportion of the total membership. We’ve done that by deliberately encouraging a culture that supports women’s involvement in the club from Saturday Slowies through to our recent women’s track program that has seen a number of women race in the popular RAW (Race All Winter) series at Dunc Gray Velodrome on Friday nights. Nearly a quarter of our junior riders are girls and young women mostly learning on the track. We asked a number of our women members about why they joined us in the first place, and their experiences with the Dulwich Hill Bicycle Club. Nearly everyone joined because they are local to the area and they found our website – so what better place to tell you what else they had to say! Camilla has been riding with Dulwich Hill for about four years and in that time has tried just about everything the club has to offer – road, track, touring, mountain biking and even riding penny farthings. Yet, that wasn’t her plan when she joined. She had just bought her first bike in 20 years, a Trek 1.2 flatbar roadie that she still commutes on. She went to Saturday Slowies on the day of the winter solstice with 5 or 6 other hardy souls and had the best time. The days warmed up, people in the club “kept building her bikes” so that she would stop riding the flat-bar and she went on the Waterfall ride (our weekly training ride) for the first time and struggled, but others helped her through her first ride and made sure she was OK. Camilla has discovered her strengths are in endurance and hills and has done the Alpine Classic twice. That’s an annual 200km ride around Falls Creek and in 2011 Dulwich Hill were well represented in various rides with over 15 of us riding and another 20 or so family members using the opportunity for a very social holiday in a beautiful area. Suzie has been riding with Dulwich Hill since 2008 and rides as a stoker on a tandem (that’s the one on the back). She is vision impaired and was originally looking for someone to ride with who had a tandem. She found 2 tandem owners and riders at Dulwich Hill and has consistently been stoker for Lindsay at Saturday Slowies, on the commute to work a couple of days a week and on done some Audax rides. Suzie likes the club because it has “something for everyone” and caters for people at all different levels. Lisa was on her second ride with the club the day we talked to her. She saw bunches cycling in Centennial Park and thought “I’d like to be in one of those groups” but they were going so fast, she realised she needed a step up. Dulwich Hill was recommended to her by people in MassBug and she found us on the website. She is so far enjoying pushing herself and thinking about how she can get faster. Michele is back with Dulwich Hill for the second time – she was a track racer in the 90s with the club, and retired when she got pregnant with her first child. She re-joined the club in 2009 when her youngest son was 14 and had started track racing with a friend. She now runs the junior development program and has built that up over the last year and organises bikes for them, racing and taking them on club rides. She sees the club has changed a whole lot since the 90s; it’s grown considerably and finds it really friendly with lots of people willing to help out. While it is social, she says there are also people who are really serious about racing. 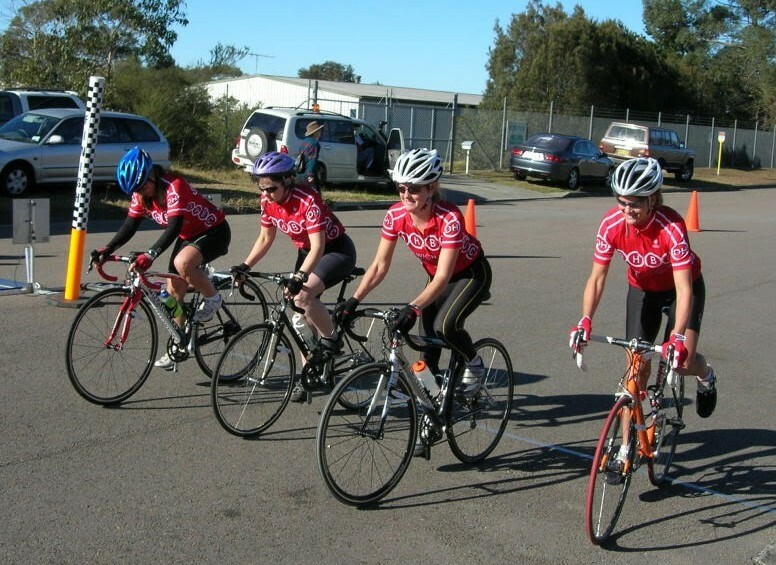 The DHBC Women's Masters Team Time Trialists starting the 2010 NSW TTT at Calga. Sue has been riding with Dulwich Hill for about 3 years and joined because she lives in Marrickville and wanted to do more riding for fitness and fun. Our starting point for Saturday Slowies is very closer to her house in Marrickville. It’s a friendly club, and she likes getting out early on a Saturday for a ride and then having the rest of the day in front of her. She’s a regular commuter and rides most days. She has an Argon 18 flat bar road bike that she rides to Saturday Slowies and a Felt commuter bike. Michelle has been riding for more than 2 years. Her partner, Peter, also rides with the club. They joined when they were looking for other people to ride with and where they could ride at their own speeds as he rides faster than her. Michelle has done a couple of longer rides, day touring in Mudgee with the club for example where she did a shorter ride and he did a longer one but met up for part of it. She absolutely loves Saturday Slowies, meeting people that you can ride along with for a while. She has an old 80s Miyata but is getting a new, lighter bike soon when Peter finishes it. Megan has been riding with DHBC on and off for about a year now. She likes cycling and being around people who do, she joined when she was living in Marrickville but even though she has moved away, she stayed “because of the people”. On her first ride, she met club stalwart Lindsay “as he was the icebreaker and really friendly and encouraged me to go on the Waterfall ride. I had the fitness and wasn’t too concerned,” She rides mountain bike, and sometimes track so also liked that DHBC has members who are interested in all those things.